Pronounce 'Ysart'? How many mice & cheese paperweights? Topic: Pronounce 'Ysart'? How many mice & cheese paperweights? 1. How do you pronounce 'Ysart'? I can find no mention of this anywhere, but it's the first question that comes to mind. Neither ysartglass.com nor this forum seems to have the answer. ISS-art? 2. How many mice & cheese PY paperweights are there? 1, 10, 100? 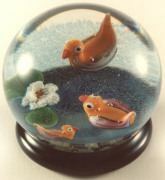 I don't collect paperweights, but his weights are so good it's hard to resist. Always liked the M&C ones. Saw one on eBay sell for ~$600 if I recall correctly. The correct pronunciation is ees-art. The family name was originally Isart and got changed by the British immigration to Ysart on arrival in the UK. All of their christian names were anglicized too! There are 3 types, 1 mouse, 2 and 3 mice. According to John Simmonds book 840 were made of the two mice design but gives no figures for the other designs. They are one of my favourites too. Frank, Anne, forgot to say thanks: "thanks!" 840 mice & cheese! Well well, there's hope for me yet then. I have now relocated something that might come as a shock to some folk. It is thought that the extremely high price was a result of two bidders fighting for it without "normal" consideration of usual prices. But even the original estimate was high, in my opinion. Nevertheless, Paul Ysart's White Mice weights do now take high money, but perhpas reality is beginning to set in again. But the $600 quoted for an example on eBay seems a snip - I don't recall seeing that one - and I wonder what its condition was? Never shocked by prices at Selman auctions. But the $600 quoted for an example on eBay seems a snip - I don't recall seeing that one - and I wonder what its condition was? My recollection is that it was in good condition with no particular problems; the price seemed low given my brief experience in watching other PY weights. I regret not taking a poke at it. Those fish weights are pretty fantastic too. I should probably just not look anymore, they're too nice. 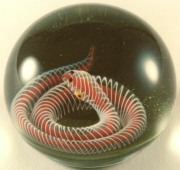 The 3D fish are quite stunning but my particular favourite is the snake with a solid red center surrounded by a white spiral. Parkington was getting some Monart from a US auction and asked me if I wanted something from the sale - I ordered the snake weight (plate 166). Better image will replace this one soon. This got him looking at the weights in the sale. a few days later I got a call from Michael profusely apologetic. It had arrived and he had fallen in love with it. The other great has to be the ugly ducklings on a pond, a parody of the antique French swans on a lake weights. Page created in 0.877 seconds with 29 queries.